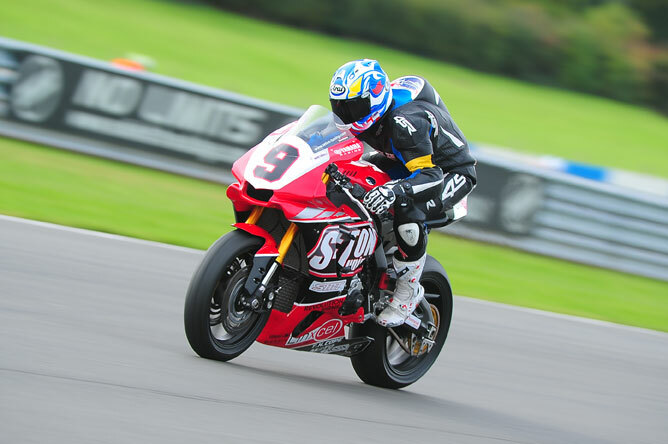 Phil Seton and former World Superbike rider Dean Ellison scooped the No Limits Endurance Championship for Seton Tuning at Donington Park at the weekend. The pairing not only wrapped up the No Limits HT Challenge 1000 Championship, they were also awarded the overall race win. The team put in a strong performance all day, qualifying in second for the three hour endurance event, just 0.055s behind BSB regular Joe Burns on the Team Edge RST machine. Dean piloted the Seton Tuning race prepared 2015 Yamaha R1, the bike that they have been developing all year. To allow Dean valuable track time onboard the Seton Tuning Yamaha R1 ahead of this weekend’s season finale of the National Superstock 1000 championship at Brands Hatch, Phil took to the circuit on a BMW S1000R. The team led for the majority of the 3 hour race, topping the time sheets after hour 1 and 2. Heading in to the final hour, the pairing had a near on two lap lead over their nearest rivals, Team Edge RST. A strong few final sessions by race-long rivals Hudson Kennaugh and Joe Burns nudged the Seton Tuning duo off the top spot at the chequered flag. However, a technical infringement elevated the Seton Tuning team to overall race win and with it the championship. Focus is now on the forthcoming season finale of the National Superstock 1000 championship at Brands Hatch GP circuit, giving the team an opportunity to race the bike at the highest national level, where it will be the only Yamaha lining up on the Superstock 1000 grid. “I really benefitted from entering the endurance race, it gave me over 1 ½ hours of race experience on the Seton Tuning Yamaha R1. My pace was respectable and I did most of the race with the same rear tyre, so I had a good feel for the R1 by the end of it all,” said Ellison.